Meigs senior Levi Chapman watches a tee shot during the 2017 Waterford Invitational held at Lakeside Golf Course in Beverly, Ohio. Chapman was one of the many area golfers to participate in the 2018 Capehart Junior Golf League finale on Monday at Riverside Golf Course. MASON, W.Va. — The final tournament of the year for the Frank Capehart Tri County Junior Golf League was played Monday at the Riverside Golf Course. In spite of the very warm weather, 38 golfers enjoyed the ‘Fun Day’ activities at the well-conditioned golf course. Fun Day means the format for the day was different than the usual tournament guidelines. All players were given a handicap based on their previous scores from the initial four tournaments. Age divisions did not exist and the boys played against the girls. The day turned out to be fun for everyone at the course. After handicaps were determined and net scores posted, the winners — based on their order of finish — were allowed to select a prize. All prizes were golf-related in some manner and ranged from a golf bag, a putter, a large selection of golf balls, golf towels, ball mark repair tools, ball marking pens, golf gloves, golf hats, and practice golf balls. Prior to giving the prizes to the various handicap winners, plaques were awarded to the individual age group winners. The boys division in the 10 and under age group was won by Alec Conway while Ali Norris was the winner for the girls. Joe Milhoan won the 11-12 age group for boys. Marlo Norris was the champion for the girls in this same age group. The 13-14 year old boys winner was Landon Atha with Caitlin Cotterill being the girls winner. The very competitive 15-17 year old age group boys winner was Whitney Byrd and Haley Pierson won for the young ladies. Douglas Workman was the winner in the 18-19 year old age group and Kaytlyn Hawk captured the ladies division plaque. The winning net score for the day was a fine 32 compiled by Noah Leachman. Noah’s gross score was a 46 with his handicap of 14 making the final total 32. Mason Morris was second with a net score of 33. One more stroke behind was Levi Chapman with his net score 34. Five individuals were next with a net score of 35. 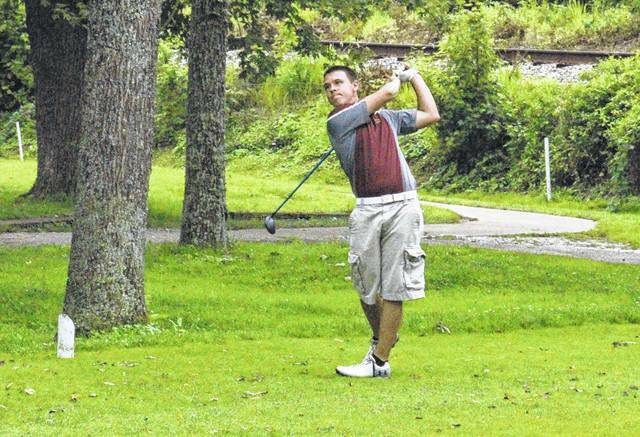 Those golfers were Wyatt Nicholson, Matt Morris, Bryce Tayengco, Alec Conway and Kyrsten Frackler. A net score of 36 was posted by Trenton Peacock and Cole Miller. Jensen Anderson, Whitney Byrd, Ryley Cotterill, Caitlin Cotterill, Kylee Tolliver, Bryce Swatzel and Teagan Conway all turned in a net score of 37. A net score of 39 was posted by Brennen Sang Jacob Spencer, Shelby Cochran, Ryan Harbour, Baeu Johnson and William Hendrickson. A net score of 40 was shot by Joe Milhoan, Grant Roush, Caleb Pierson and Issac Roush. 41 was the net score posted by Ethan Roberts, Timmy Russell, Ben Supple and Cody Bowman. Both Evan Pope and Jarrett Hupp netted a score of 42. Porter Midkiff and Mason Washington netted a score of 43. Kaytlyn Hawk and Blake Fackler netted identical scores of 46. John Greer’s net score was a 49. The cooperation of parents, event sponsors, the local golf courses and other volunteers help make the league a real success. Because of this cooperation, many young men and women are learning the game. It is a game they can enjoy for a lifetime. The directors of the league, Jan Haddox, Jeff Slone and Bob Blessing, are looking forward to continuing the league for many years to come.